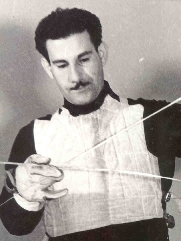 Mel North was Head Fencing Coach at UCLA for nearly two decades. His fencing club, Salle de Nord, was recognized as one of the premier fencing clubs in the United States. Between 1960 and 1980, North's UCLA teams won 19 individual and team championships, scoring 362 victories with only 18 losses. In one stretch, his Bruins recorded 174 consecutive wins. North was Director of the U.S. Olympic Fencing Camp for the West Coast, held at UCLA He was head foil and epee coach at the Olympic training Center at Colorado Springs. And, he was also appointed Director of the West Coast Junior Olympic Training Program. Mel's 1965 Junior team was the first U.S. Junior Olympic team to win a World Championship. The Chicago-born fencing master was captain of his high school and University of Chicago fencing teams. Following college, he became the head fencing coach and head aquatics supervisor at the Westside Jewish Community Center in Los Angeles. He has developed champions on every level, from high school to the Olympic Games. His proteges include members of more than 50 World teams, five Pan Am teams, the World Cup, World University Games, 6 Olympic teams, 9 Martini-Rossi Challenge Teams, and five Maccabiah Games. Among his numerous international assignments, Mel North has served as consultant to the 1964 U.S. Olympic Team, coach-consultant of the Korean Olympic team, and coach of the Saudi Arabian World University Games team. Through the years, Mel has choreographed fencing scenes for motion pictures, operas and TV commercials; and trained numerous actor students, including: Danny Kaye, Basil Rathbone, Frank Langella, Ross Martin, Dean Jones and Neil Diamond.